Regina coeli, laetare, alleluia: Quia quem meruisti portare, alleluia. Resurrexit sicut dixit, alleluia. Ora pro nobis Deum, alleluia. Oremus: Deus qui per resurrectionem Filii tui, Domini nostri Iesu Christi, mundum laetificare dignatus es: praesta, quaesumus, ut per eius Genetricem Virginem Mariam, perpetuae capiamus gaudia vitae. Per eundem Christum Dominum nostrum.R. Amen. Queen of Heaven rejoice, alleluia: For He whom you merited to bear, alleluia, Has risen as He said, alleluia. Pray for us to God, alleluia. Let us pray: O God, who by the Resurrection of Thy Son, our Lord Jesus Christ, granted joy to the whole world: grant we beseech Thee, that through the intercession of the Virgin Mary, His Mother, we may lay hold of the joys of eternal life. Through the same Christ our Lord. R. Amen. In the festive atmosphere of Easter, the Pope also mentioned the “joy of an important anniversary. Five hundred years ago—April 18, 1506, to be exact—Pope Julius II laid the first stone of the new Basilica of St Peter, [a structure] that the entire world admires for the powerful harmony of its forms”. 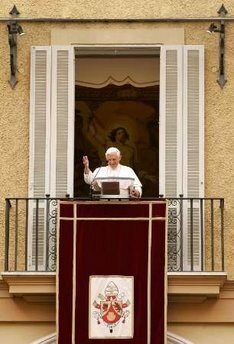 Following the prayer, Benedict XVI greeted in different languages the pilgrims who had gathered in the courtyard of the Apostolic Palace. When he came to greet them in Italian, a group of young people from Naples (Italy) began to sing a well-known Neapolitan song, Ohi vita, Ohi vita mia. Amused and cheerful, the Pope responded saying: “I see there is no lack of Easter joy” among you.